First I found this lovely table cloth - hand work, not machined. Then the flower patterned cushion and the silverplate. 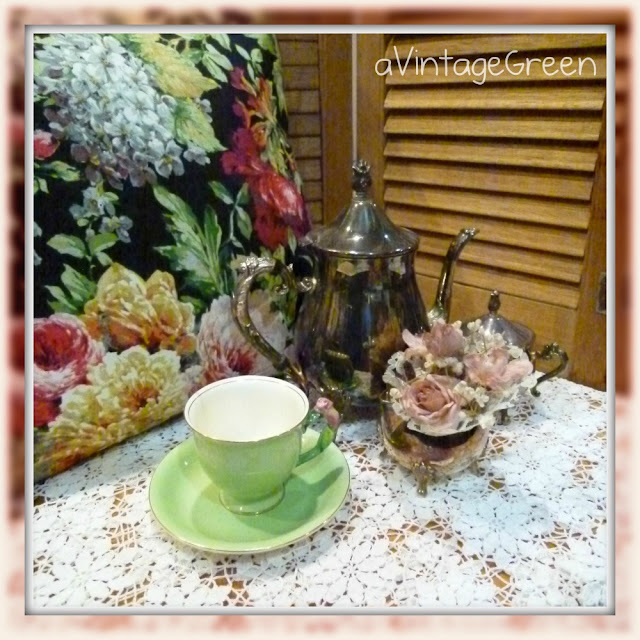 Added my teacup and shutter and had a vignette. I am showing the 'before' first, the 'after' follows. The refinished frame with the painting needed some additional decoration for a vignette so I grouped the crocheted table cloth with the painted chair (a previous post) and the painting. 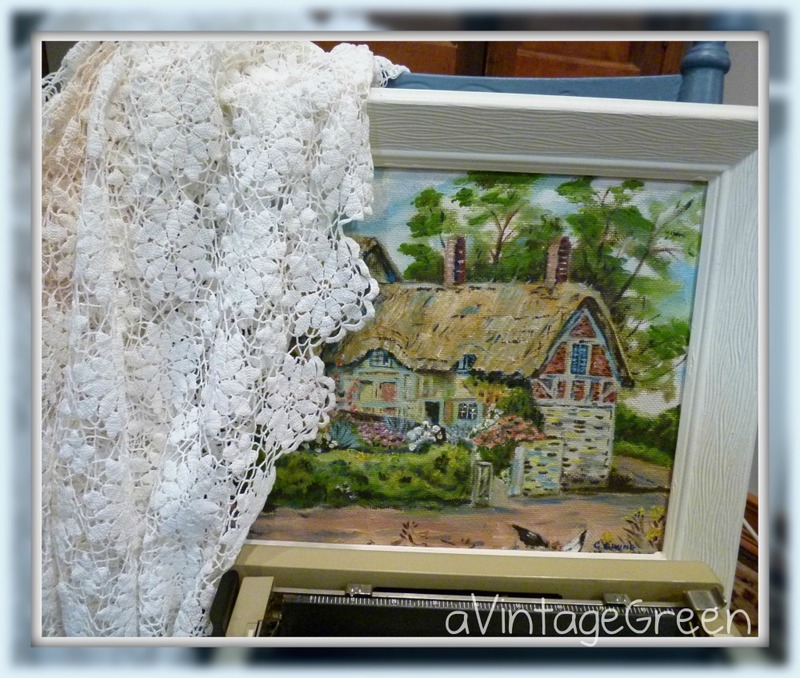 I worked on the framed painting found at the same garage sale last weekend, a thatched cottage painted on the rough (back) of a piece of masonite. The frame was brown. 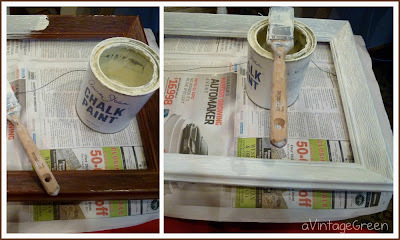 I thought it would look better white so I watered down my ASCP Old White a bit and gave the frame two coats. The next day I waxed and buffed and put the picture back in its frame. 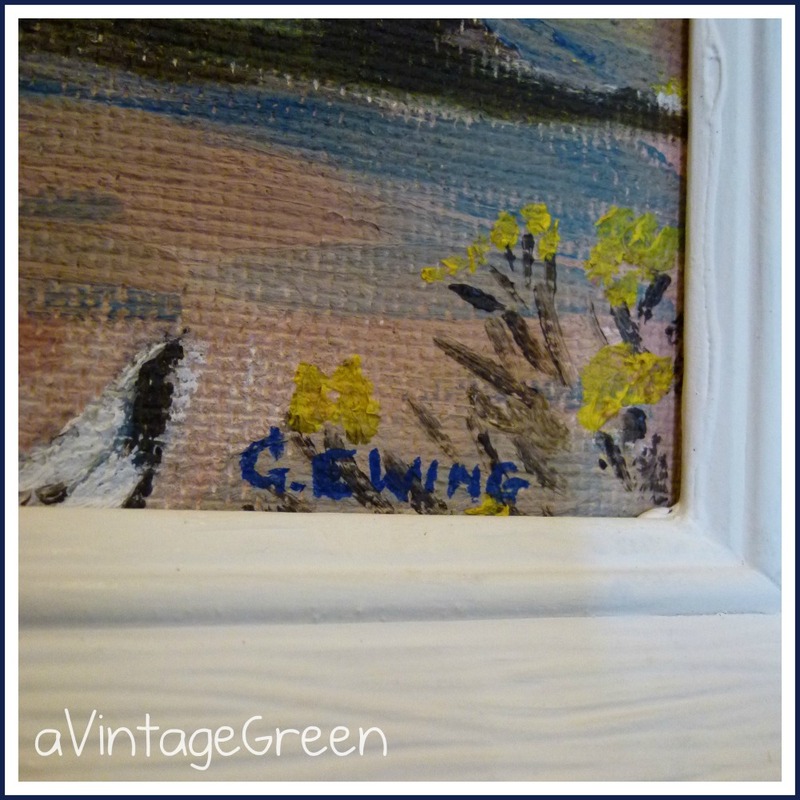 G. Ewing is the artist's signature. It sure does look better in the white frame. Nice tutorial, and the picture is very neat. Visiting from VTT. 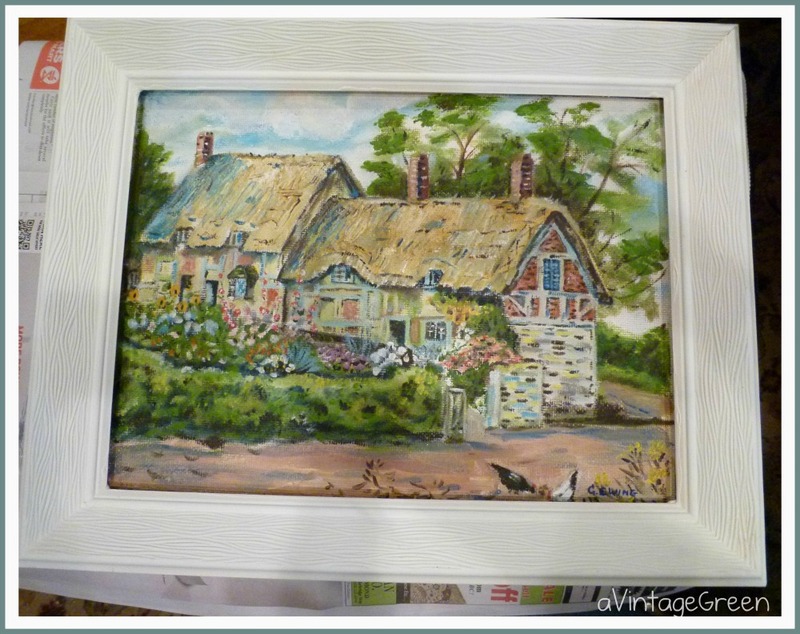 That is such a beautiful picture and I love the way you treated the frame, very nice! What a dramatic change you made in the frame. Looks very nice. What a pretty picture! 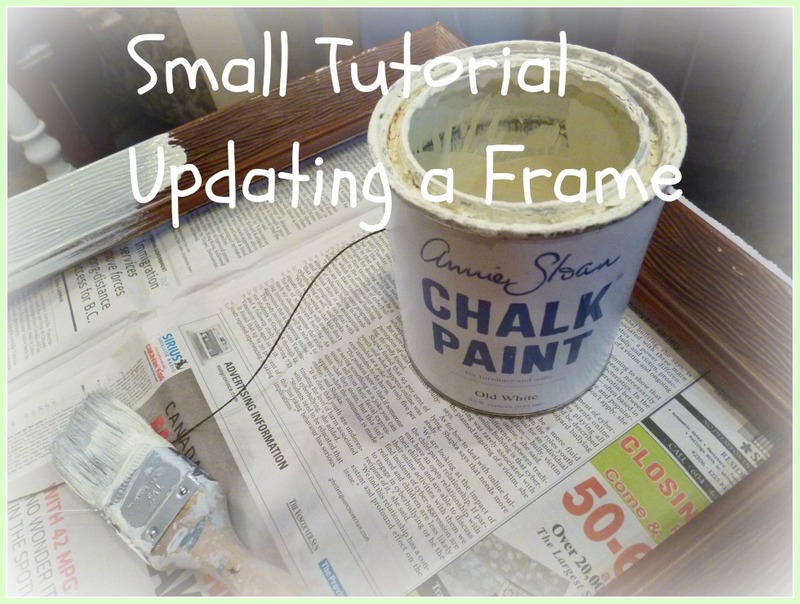 You just did such a great job on the frame! It looks so pretty. hi Joy ... love the picture and the make-over on the frame is just perfect. Good job ! That tablecloth is absolutely gorgeous! Love the painting and the white frame is just what the Dr. ordered. I too love using old shutters. 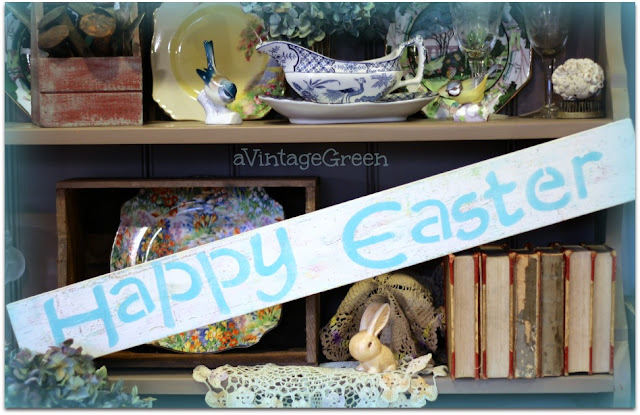 I have two that I painted robins egg blue on an old door shelf in my living room. Thanks for sharing this with Share Your Cup Thursday! Your frame turned out just perfect! Thanx for coming to THT! I love the painting! And the tablecloth! Such great finds and your frame transformation is gorgeous! Great job! I like it so much better that way, and you made it look fresh and lovely by painting it! Thank you so much for joining me for Pearls and Lace Thursday!